At MacWorld a few weeks ago, Apple introduced iWork 09, which brought us Keynote version 5.0. Keynote is, of course, Apples answer to PowerPoint. While PowerPoint has long been the scourge of boardroom meetings--a phrase has even been coined, “Death by PowerPoint”--Keynote aims to be the sexier, cleaner and more Apple alternative. I’ve mentioned my fondness for Keynote before, and I was excited to get my hands on a copy of the new version to see if it has anything new to offer us church presentation techs. While Keynote does indeed include some new features, I’m not sure it’s a must-have upgrade from the previous version. On the other hand, at $79 for a single license and $99 for a 5-pack, it’s hard not to upgrade; especially if you find useful the upgrades to Pages and Numbers (and I do). I’ve now spent some time with 5.0 and I am impressed. The first thing you’ll notice when you launch are the eight new templates, bringing the total to 44. As always, the provided templates are very clean and well designed. I’m not normally a fan of templates; however sometimes when we’re in a hurry, it’s good to have them as a starting point to put a presentation together. We use Keynote every week to put our sermon notes together, and I was hoping to see some new features that would make my life easier. As I looked over the interface, nestled in the middle of the formatting bar is a little check box labeled, “Auto-Shrink.” This feature alone might be worth the upgrade. When checked, ideally in the master, if more text than will fit within the confines of the bounding box is entered, the text will shrink to fit. We do this manually to make headlines and scripture slides fit, but now it will happen automatically. I like that. While we don’t use Keynote to actually present the notes (we export as jpgs, and play them back from ProPresenter), there are some excellent enhancements to the animation capabilities and presentation mode that almost make me want to present from Keynote. First, a new feature called Magic Move will take an object, say a photograph, and create a smooth animation between two points. For example, if you want to start with the picture small then zoom it larger, you simply place the start position and size on one slide, the end on the other and select Magic Move. Keynote will create a smooth animation between the two points. There are also enhancements to path animation, if you use that feature. It is now easier to edit the paths, and even use one shape as a path for another. I’m not sure how much this would come into play in a sermon illustration, but you never know. Something I discovered while playing with 09 (and was a part of 08--guess I missed it) is Smart Builds. 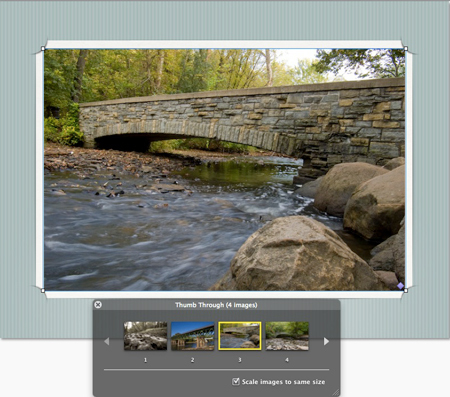 If you need to show a series of photos, rather than create a bunch of slides, each with a photo on it, you can simply insert a Smart Build, add photos to it through a simple drag-and-drop interface and present (or export) the whole series from a single slide. There are several useful animations for transitioning the photos that would tastefully add some life to a presentation. I will be looking for opportunities to use this feature more in the future. Tomorrow we’ll continue with the review and look into enhancements made to presentation mode, and compare it to it’s nemesis, PowerPoint. That should be fun!